Although I didn’t grow up eating Brussels sprouts, as an adult I’ve fallen in love with them. And, while I make them often, I’ve only posted one Brussels sprouts recipe on the blog. I knew I had to change that. Fortunately I came across this easy and delicious pasta with ricotta and Brussels sprouts recipe from Culinary Adventures with Camilla, my assigned blog for this month’s Secret Recipe Club. When I first got my SRC assignment, I spent a long time going through Camilla’s posts and quickly became enamored with her creative recipes. I love that she includes her two adorable sons in the cooking process, and isn’t afraid to introduce them to new foods. I especially like her international series, Cooking Around the World with Camilla, in which she and her boys are cooking their way through all the countries of the world from A to Z. It’s an amazing way to learn about the world, and is a practice I hope to borrow in the future. I was going to pick one of Camilla’s international dishes, and had my eye on her menu from the country of Georgia. But then I came across this recipe, had most the ingredients on hand, and knew it was the one. Her original dish, Penne with Brussel Sprouts, Figs, Hazelnuts and Pradera, was an adaptation of a Mark Bittman recipe selected for the Food Matters Project. While the original recipe was baked rigatoni with Brussels sprouts, figs and blue cheese, I loved Cam’s take on the original, in particular her substitution of blue cheese (not my favorite) with Pradera, an aged gouda. Yum. But, since I didn’t have any on hand I went with parmesan. And I didn’t have figs, to skipped that too although I’d love to try it that way next time. I loved this hearty pasta dish, which is a nutritious meal all in one bowl. 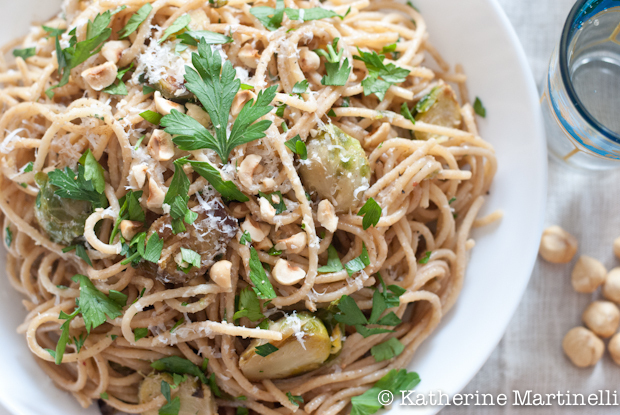 I wouldn’t think to add hazelnuts to a pasta like this and enjoyed both the flavor and texture it added. The ricotta and parmesan made it creamy and, while not necessary, whole wheat pasta made it just a tad healthier. Any pasta shape would work, but I really enjoyed it with spaghetti. This easy weeknight dinner comes together quickly and will have everyone asking for seconds. For a healthy kick, use whole wheat pasta and low fat ricotta. Cook the pasta in a large pot of rapidly boiling salted water until al dente. Reserve ½ cup pasta water, drain and set aside. Meanwhile, heat olive oil in a large sauté pan. Add the garlic and Brussels sprouts and cook over high heat until lightly browned, about 8 minutes. Remove from the heat and add the cooked pasta, parmesan, hazelnuts, parsley, ricotta and balsamic vinegar. Toss to thoroughly combine, adding a splash of pasta water if too dry. Season with salt and pepper, garnish with additional parsley and chopped hazelnuts, and serve with additional parmesan. Awwww…thanks! I love your adaptation and your post. Have a great month. I created a post with a link back to you. Enjoy. I love the brussel sprouts sauteed with garlic, perfect! Yum! 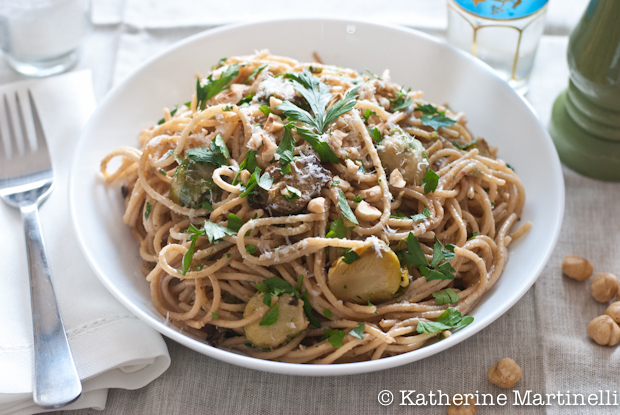 I am a huge brussels sprouts fan…this pasta sounds amazing! I’ve never used Brussels sprouts in a pasta dish! I don’t know why it never occurred to me to do so. This is fantastic – love the flavors. Good stuff, nice food styling on the photos. I also came to love brussels sprouts as an adult, and this recipe looks awesome!! Love the way they’ve been paired with such unexpected flavours in this pasta… I’m definitely going to have to give it a try next time I’ve got some Brussels sprouts on my hands! Every time I see a recipe like this it makes me so, so sad that my family hates Brussels sprouts. This is totally my kind of food! I am tempted to go to the market now to see if they have started to sell brussel sprouts. I am wondering how my husband will take the flavor of those veggies. thanks Katherine! Brussels sprouts are very tasty and I never get bored eating them! Your pasta looks very delectable Katherine! Sounds great-I have always wanted to try the secret recipe club! This requires only two words. So different to what I have cooked with the same ingredients! Thank you: one does learn!! wonderful pasta! I love ricotta and Brussels sprouts – it must be absolutely delish! I’ve been craving brussels sprouts lately, these looks fantastic! Pasta and brussel sprouts, it looks very good, brussel sprouts are one of my favorites. brussel sprouts sautéed with garlic – yum!! this looks lovely, K! I just bought some brussels sprouts at the farm market… I’m dying to try this. The recipe is great, but it doesn’t mention what to do with the balsamic vinegar even though its in the ingredients list. What’s it for? Oh goodness, it should be added in step 3 – fixing now. Thanks so much for noticing!